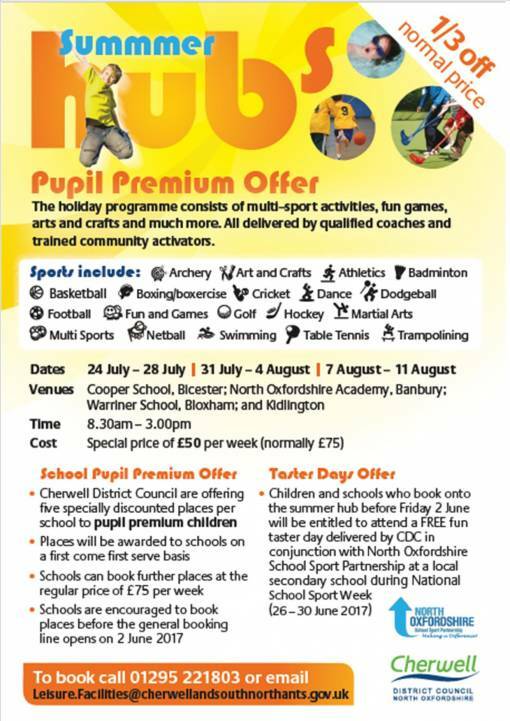 Cherwell District Council is offering one third off the normal price of this this year’s Summer Holiday Hub programme to children from disadvantaged backgrounds. Partner schools are invited to book up to five specially discounted places for pupil premium children. Schools are requested to meet the remaining cost from pupil premium budgets meaning that children get to attend one full week of the programme free of charge. This offer provides schools with yet another opportunity to support the health and well-being of some of our most vulnerable youngsters. Children and schools who book onto the summer hub before Friday 2nd June will be invited to attend a FREE fun taster day delivered jointly by Cherwell District Council and North Oxfordshire School Sport Partnership during National School Sports Week 2017.